For those "mist-and-go" mornings, Wen has the perfect solutions to keep your hair looking great, even when you're short on time. My two time-savers lately have been their Texturizing Treatment Spray and Replenishing Treatment Mist. They're both multi-purpose products that keep my hair looking great and in true Wen fashion, smelling fabulous as well! 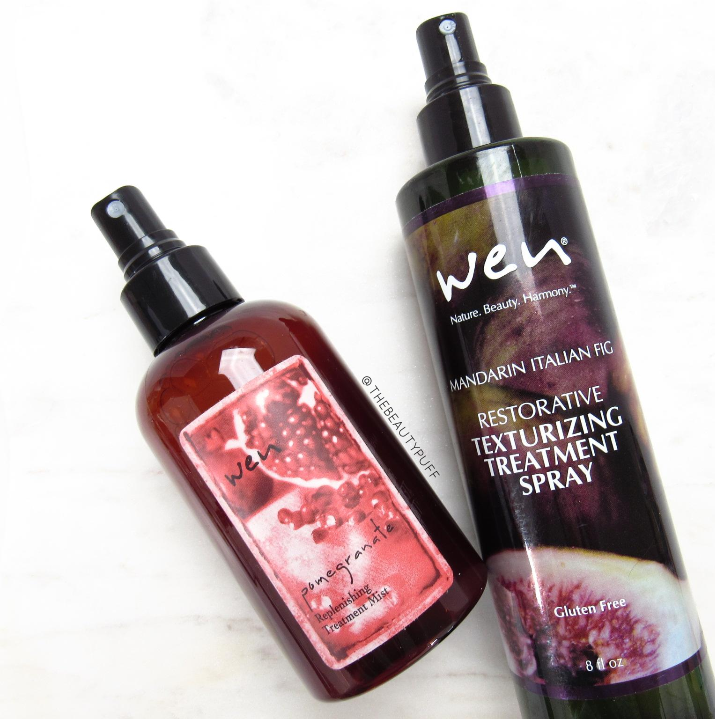 Texturizing Treatment Spray | While one-size-fits all definitely doesn't apply to most hair products, this one comes pretty close! This texturizing spray can be used whether your hair is wavy or straight, thin or thick. It's a weightless spray that you use as the last step in your styling routine. It helps you achieve a lightly tousled look without the crunch or heaviness of typical sprays. Simply spray from mid-length to ends when hair is wet and style as usual. You can even use it on dry hair to add a bit of volume at the roots. This texturizing spray comes in Bamboo Green Tea and the scent I have which is Mandarin Italian Fig. Replenishing Treatment Mist | Whether your hair needs a bit of refreshing between washes or extra conditioning due to damage, this replenishing mist is fabulous. You can use it on wet or dry hair to give it some much-needed moisture. I love using this mist on my second day hair after straightening it with a blow dryer. It gives a weightless smoothness and an irresistible smell of pomogranate that I've been really loving this summer. To top it off, this mist can also be used as a facial mist! That's something else I've been favoring during the warmer months. Facial mists have been my secret weapon to refresh my skin whether it's first thing in the morning or for an afternoon pick-me-up. It makes me love this multi-tasker even more. You can find both these Wen favorites on their website below.